“A lacto sweet stout? !” I thought. Worth a try as I like sweet things, I enjoy stouts, and I love all things made from milk, and you have to be a fan of all those three to ensure that you enjoy this concoction. Kiuchi brewery have produced a beer that’s got so much going on, that this lacto sweet stout is not for the faint-hearted. 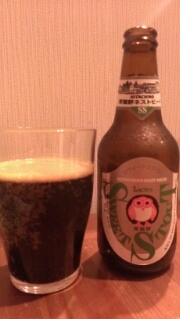 Anyway, Hitachino Nest Lacto Sweet Stout has an abv of 3.9% and is available all year round. Don’t let the pitch black colour fool you. Hitachino Nest Lacto Sweet Stout pours very quickly out of the bottle and does not need any time to settle. The small amount of head present was an off white colour with a slight blackish tinge and the body was pitch black, a good start for a stout. Aroma wise, there is definitely a milky aroma from the beer, which could be disconcerting for those not expecting it but it’s a lacto sweet stout. The follow-up smells of roasted malts and coffee helped settle the nose but the brain was confused with what was happening. The first flavour that came through tasting was cheese, akin to a gorgonzola or a similar blue-veined cheese that was a tad overpowering against the roasted malt flavour. I expected more of the natural stout flavours to come through; however, the cheesy taste lingered a little too long in the mouth and the subtle sweet taste was not balanced enough against the lacto taste. It is hard to recommend this beer unless you’re a big fan of lacto sweet stouts.